Our planet earth is getting smaller day by day with the advancement of science and technology. It has become a lot easier now to know about what’s happening on the other side of your world without even moving an inch. But, then comes the real essence of exploration. Exploration enables you to know that there are many things yet to be discovered or explored which are either left untouched or not spoken about under our ignorant eyes. Such is a case of the legend of “U-thlen Menshohnoh” of Meghalaya. The North Eastern states of India are famous for its diverse practice of various cults and sorcery since the ancient times. We can find mentions of such events and places in the region where such sorcery and wizardry were practised even before civilisation began to flourish in the other parts of the mainland India. In Yogini Tantra and Kalika Purana, we can find various mentions of how and what kind of sorcery was practised during this period in the region. However, it is important to realise that many things were left untouched and remained unexplained in this category. Black magic, witchcraft and superstitious beliefs have been part of tribal customs in the Northeast India. Many tribal communities practice indigenous faiths and resort to mythical beliefs and related rituals for treating ailments too. In the state of Meghalaya, the myth of Menshohnoh meaning ‘cut throats’ is still prevailing. In the following worship, the black magicians or the sorcerers worship U Thlen, which is a huge serpent which gets satisfied only with human sacrifice. As the faith prevails that the ritual is helpful in acquiring immense riches. The myth is quite commonly retold in Khasi-Jaintia Hills. In the month of march earlier this year, I along with one of my friend visited a place called Laitlum near Shillong. It is a grand canyon with its picturesque view of clouds and long mountain range. 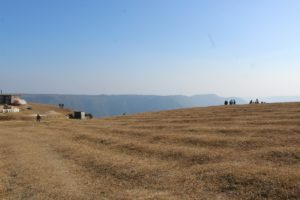 This place is located at a distance of 17 km away from Shillong. We began our journey from Nongpoh towards Jowai and after crossing Shillong we reached a place called Smit. From where we took a right turn and travelled for about 4 km to the Laitlum grand canyon. After spending hours of climbing when we settled for a cliff and no way beyond, we decided to make our camps for the night. We were also accompanied by the cousin sister of my friend and her daughter. My friend’s sister was a former actress of Assamese movies and hails from Assam. However, she has been married for last 15 years or so and settled in Meghalaya. And she was the only one among us to be completely accustomed to the cultures and traditions of the Khasis. When we expressed our desire to make our tents out there she rejected it on a single note. She told us about the myth of Menshohnoh and also warned us how dangerous it would be to make camps in open in that season. It was the season of Menshohnoh after all. 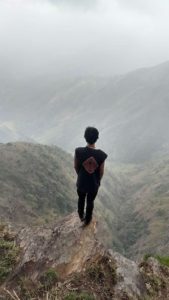 It may sound a bit interesting or a subject to be fantasised about by people in love with adventure, but in reality, its quite dangerous which may result in ending up your life. As the myth goes there was a giant serpent in the area that feeds on human blood. One day a man killed that giant serpent and brought pieces of its flesh and distributed among the people of his village. He kept its head and gave it to his mother. The next morning he and his mother left home to perform daily chores in the jungle. When they came back from work they witnessed that someone has already finished every other chore in the house from cooking to washing and everything else. When the mother asked her son whether it was he who did it all, he refused to agree and said he was with her out in the jungle the whole day. The next day the mother sneaked into her own house after everyone left for work. After waiting for a while she saw a girl coming out of the skull of the serpent and started finishing household chores one after another. The mother, on the other hand, didn’t react and watched her until she finished her works. When she was done and about to return to the skull she rushed and threw the skull into the fire and caught the girl. the girl was trapped and couldn’t escape. When everybody came back from their work she introduced her to the family. She was compelled to marry her son. She was a beautiful lady and he had already seen enough of the way of her working so he readily agreed to the marriage. As the days passed he witnessed that his wife didn’t eat anything at all. And one day when he asked her about it, she replied that she don’t eat such edibles and only feeds on human blood. The man was so much in love with his wife that he started going out in the night in disguise in search of human blood for her. Once he started feeding her human blood their fortunes began to rise. They became rich in a very short period of time. Smit has been known for the practice of wizardry and sorcery since ancient times. Even now some people in the Smit locality believes in this myth and thus hire killers for human blood to feed snakes. These hired killers in disguise just slit cut the throat of a person and collect the blood. People believes that this act would make them rich. Mentionably Sohra is believed to be the origin of Legend of U Thlen, for decades such occurrence remains silence only to surface once again coming back from tales into reality, which had provoked research scholars and many others to believed the completion of a cycle of this myth. I have learned two things from this incident. The growing instances of suspicious witchcraft and sorcery in the region which is not only disturbing the peace but also causing loss of many lives. We need to check them as soon as possible because such practices are making our civilisation ashamed and creating havoc. The state occasionally witnesses such disturbing cases of black magic that disturbs the conscience of the entire nation. However, it should be worth noticing that the Khasi people still retain their beliefs in a repressed way. They never go out in the night alone, they never allow any stranger to touch their heads, and they usually carry a handful of rice wherever they go. This and many practices of the kind are still being seen today and remain as an integral part of their belief. In order of tourism to thrive in the state, we need to promote the abolition of such practices. The legend of U Thlen in the Khasi hills have not faded to oblivion yet. Many cases have been registered earlier this year of missing people. This is such a sudden happening that people have begun to wonder the plausible reasons for the rising number of the victims in the region, which occurs twice. Secondly, know the place before you go out there. You never know what awaits you. So before you are going out to a whole new place just try to know a few things about that place. And always try to communicate with the locals. Because the place you are going to visit is not meant for making you comfortable, but the locals instead. Many incidents of human slaughtering for sorcery are filed during this period so its quite dangerous to be out there if you don’t know any locals. Well, we didn’t camp that night at Laitlum and returned to Nongpoh for the stay. But we are definitely looking forward to camp at Laitlum grand canyon some day. The north east is a paradise for those who wants to live with nature. But in order to do that, we must ensure the security of not only the visitors but also of the natives from such superstitions and mal-practices. As they say “prevention is better than cure”.